Fire sprinkler systems, they can save lives! Understanding the basics of fire sprinkler systems is critical for homeowners and business owners alike. In fact, properly working sprinkler systems have a wonderful way of reducing the damage caused by a fire. As a result, they are an essential component of any fire safety plan. Here is everything you ever wanted to know about the powerful, life-saving, and miraculous fire sprinkler systems. When it comes to fire sprinkler systems, there are two different types to be aware of: wet systems and dry systems. However, there are two lesser known systems and are used less often: preaction and deluge. These special sprinkler systems are typically used for special hazards and applications. Instead of water, fire sprinkler systems will contain foam to help in the event of a fire emergency situation. In essence, all of these systems simply send water or foam to the fire’s location to control, confine, and extinguish it. As a result, fire sprinkler systems are extremely effective tools during a fire emergency. However, having trained firefighters assist with any fire emergency situation is always a necessity as well. Just as the name implies, wet sprinkler systems use water to control a fire. 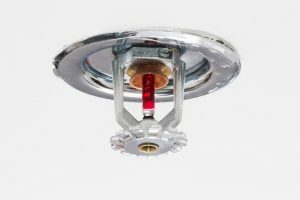 In fact, wet systems are usually the more common fire sprinkler system seen in homes, apartment buildings, and businesses alike. In the event of a fire, the fire activates the individual sprinkler heads which disperse out water to control the fire hazard. On the other hand, dry systems don’t have any water within the pipes. Instead, dry fire sprinkler systems use compression or some other source of air to hold back the dry pipe valve until the heat of the fire melts the link or bursts the bulb on the sprinkler heads. As a result, the air rushes out and releases the pressure on the dry pipe valve which allows the water to flow and extinguish or control the fire. No matter what your needs are, Anderson Fire Protection, Inc. is here to design, install, and inspect a fire protection system that will work for your residential or commercial space. With more than 26 years of experience, Anderson Fire Protection, Inc. is able to offer you experience and reliable customer support. For more information on working with Anderson Fire Protection Inc., call us today at 410-796-4915 or click here for more information. This entry was posted on Friday, June 30th, 2017 at 10:38 am. Both comments and pings are currently closed.